I began making tiramisu in 2002, when my roommate Lia and welcomed our German roommate Anna to Lia’s house in Milan). It turned out that Anna didn’t really like tiramisu, so I found myself eating it for breakfast for about a week. And I was hooked. Up until recently, I’ve bought Savoiardi and Mascarpone for the recipe. The cost for Savoiardi ended up being around $6.00 ($2.99 per pack), and mascarpone cost $3.99 for an itty bitty container, so I bought two and already the cost of making tiramisu was $14. 1) Bring water in a pot to boil in a pot. Reduce the heat to medium-low so the water is barely simmering. 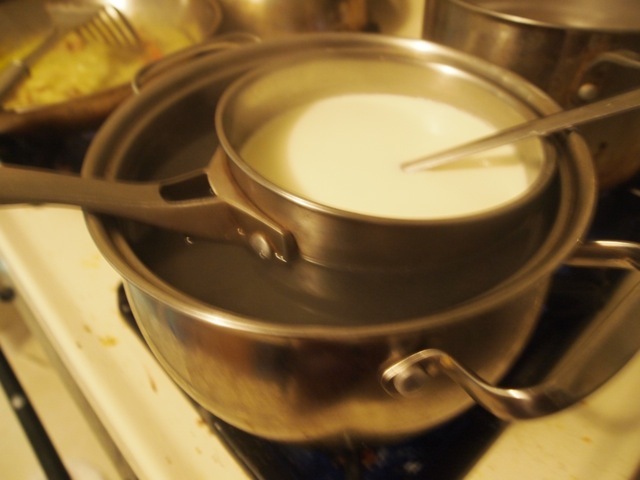 2) Pour the heavy cream into a smaller pot, then put the small pot into the bigger pot. 3) Heat the cream, stirring often, to 180F. It will take about 15 minutes of gentle heating. I found it hard to get it the last few degrees-- I had to increase the heat slightly near the end. 4) Add the lemon juice and continue heating the mixture, stirring gently, until the cream curdles. 5) The cream will only just thicken to cover the back of your wooden spoon. 6) Remove the bowl from the water and let cool for about 20 minutes. 7) Meanwhile, line a sieve with four layers of dampened cheesecloth or a handkerchief and set them over a bowl. 8) Transfer the mixture into the bowl, or into a sieve over a bowl. Do not squeeze the cheese in the cheesecloth or press on its surface. 9) Once the mixture has cooled, cover and refrigerate for about24 hours, or until it becomes firm. The main thing I learned from my first mascarpone attempt was not to worry if the curd didn’t seem thick enough, or even if it doesn’t taste that great. It works out. 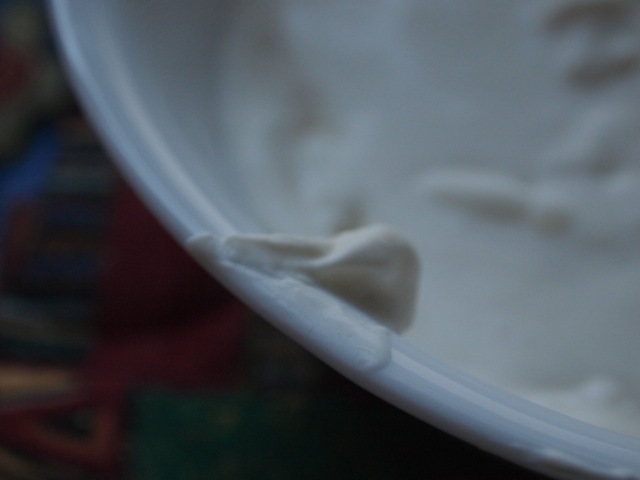 I had to use ultra-pasteurized cream, even though it isn’t ideal, and it worked out well. For the savoiardi, I used this recipe. As you can see from the picture, I overcooked them. Again, it didn’t seem to matter to the final product. The texture was the most important thing. I copy the recipe below, with my comments. 1) Preheat oven to 400 degrees F (205 degrees C). Line two 17 x 12 inch baking sheets with baking parchment. 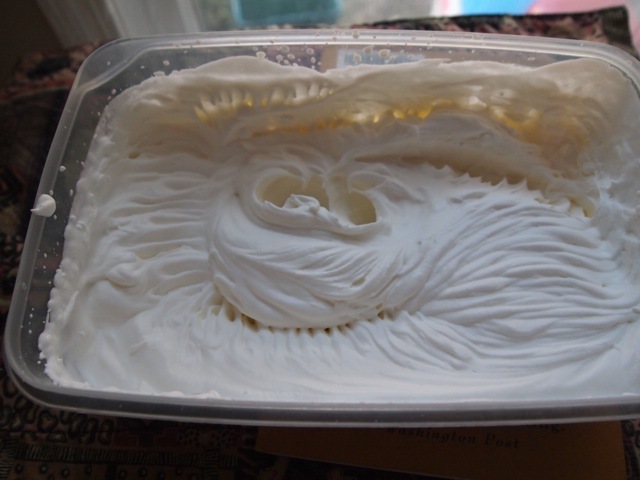 2) Place egg whites in bowl and beat on high until peaks start to form. Slowly add 2 tablespoons of the sugar and continue beating until stiff and glossy. In another bowl beat egg yolks and remaining sugar. Whip until thick and very pale in color. 3) Sift flour and baking powder together. 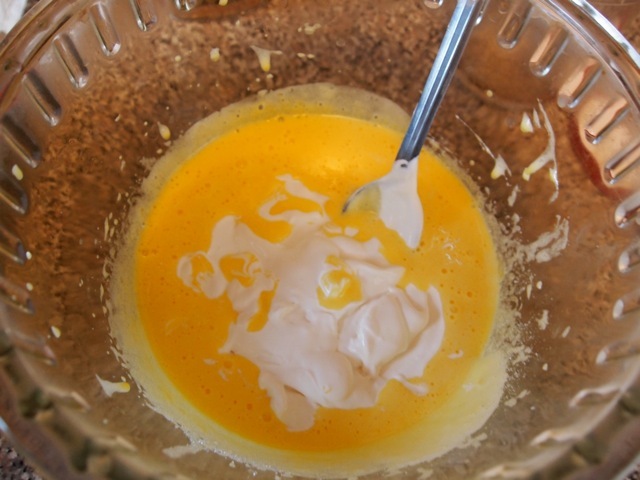 Fold half the egg whites into the egg yolk mixture. Fold in flour, and then add the remaining egg whites. Transfer mixture to pastry bag and pipe out onto prepared baking sheet. If you don’t have a pastry bag, you can spoon them out. 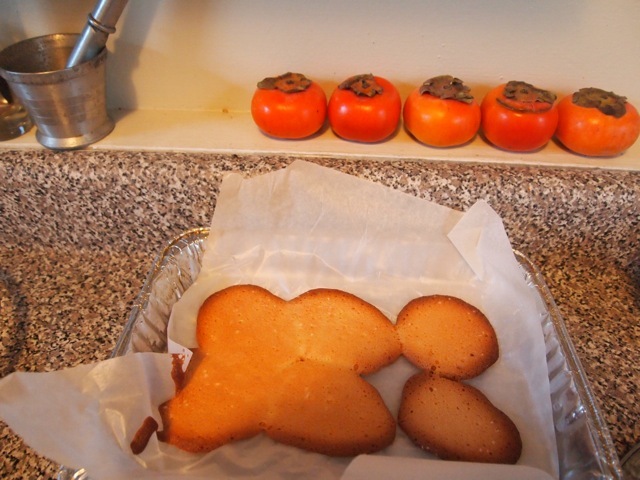 The result is not as beautiful, but since they’ll be inside the tiramisu, it’s ok. The instructions say to bake bake for 8 minutes, but i found that 8 minutes were too few, and 12 too many. 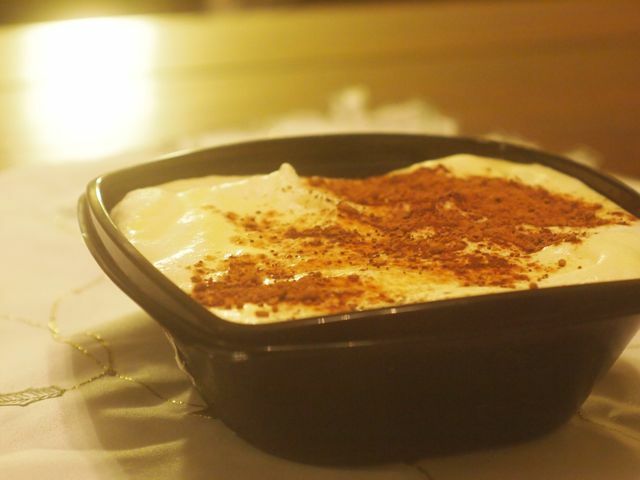 Now you’re ready to make tiramisu! 1. 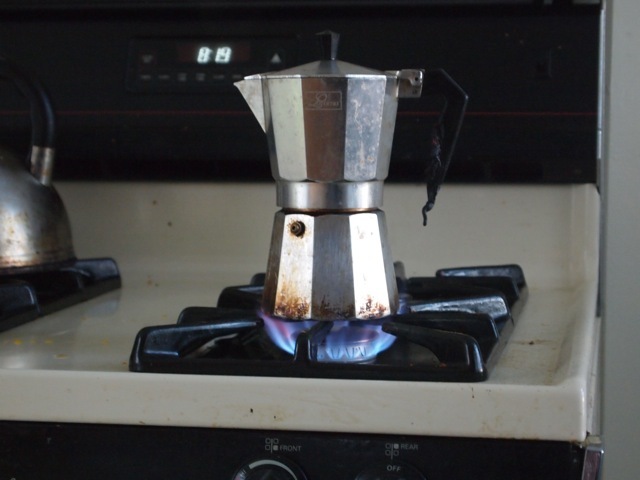 Grind your coffee beans, put into your little stovetop expresso maker, and brew. An 8-cup maker is just about the right amount of expresso. I’m no tiramisu purist, but i believe this is the ingredient that matters most; it’s important to use expresso. Let the expresso cool down in a flat-bottomed container (for easy dipping later). 2. Separate 5 eggs into whites and yokes. I’ve worked on this recipe to try to reduce waste: many recipes use many more whites than yokes, but then what do you do with the remaining yokes? 3. Beat the yokes. a lot. Add about ¼ cup white sugar and continue beating until the mixture lightens. 4. 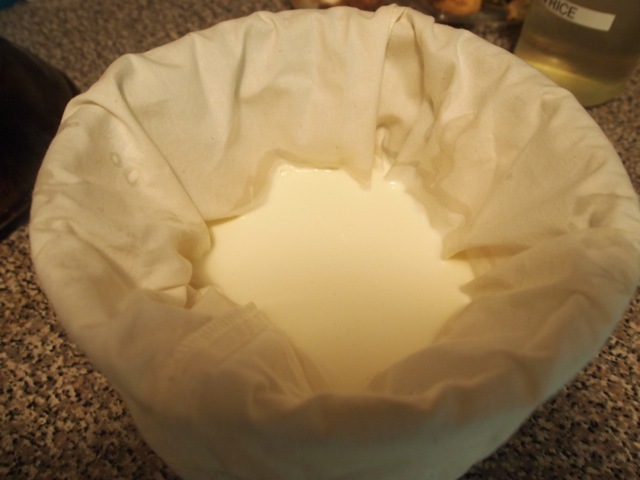 Fold the mascarpone into the yoke mixture, until just barely combined. 5. 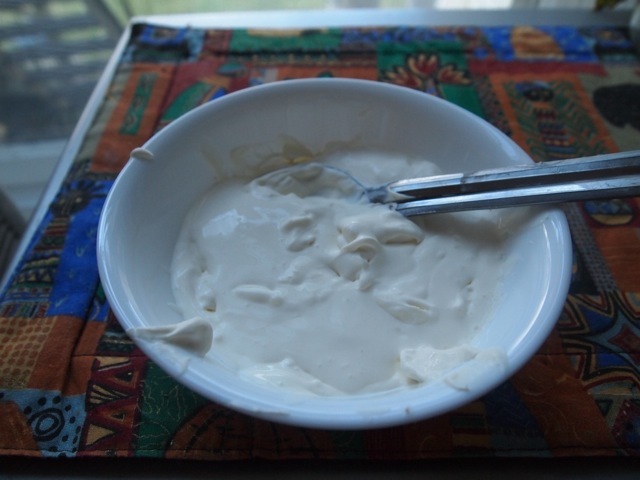 In a second bowl, whip heavy cream you have left over from making mascarpone. 6. 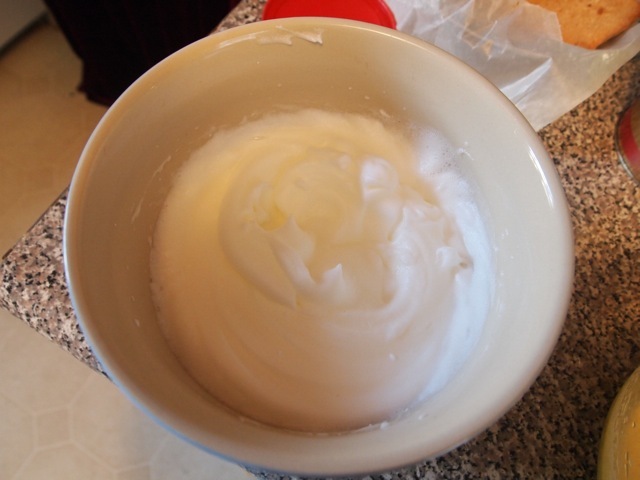 In a third bowl whip egg whites until you can turn the bowl upside down without anything falling. You want this third bowl to be the last one that you beat, because folding the whites in while they’re freshly beaten helps the mixture hold together. 7. Fold the yoke/mascarpone mixture and the egg whites together- add some whipped cream, as needed to keep the mixture light and airy (usually just a couple of tablespoons!). 8. Optional- you can add some finely chopped chocolate to the mixture if you like. Now, get out a pie container or whatever you’d like to use to hold the tiramisu (it just needs to be about an inch and a half deep.) 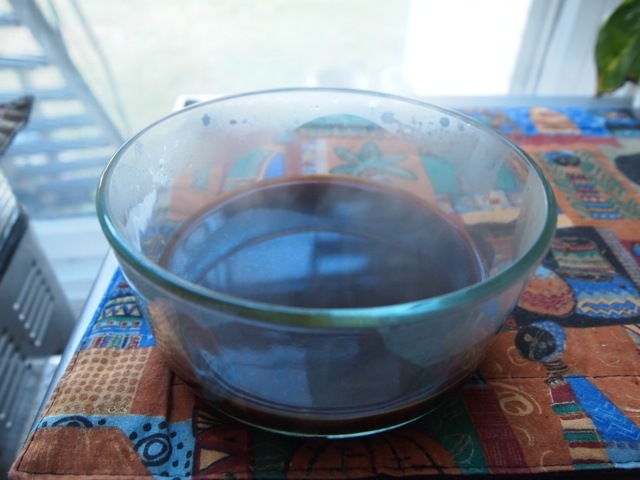 Have your cooled coffee (you can add a little liqueur or vanilla to it if you like) and the savoiardi nearby. Dip the savoiardi in the coffee, very briefly, and lay them, dry side first, in your dish. Add half of the zabaglione mixture, and a dusting of cocoa. Then do one more layer of savoiardi, and the other half of the zabaglione. Leave to sit in the fridge for a few hours (or overnight), before enjoying! Oh wow... what energy!! :) AMAZING!! I got the energy from you, mom!